Sebastian Scherer's glass tables resemble cubistic objects and invite us to play with optical illusions. 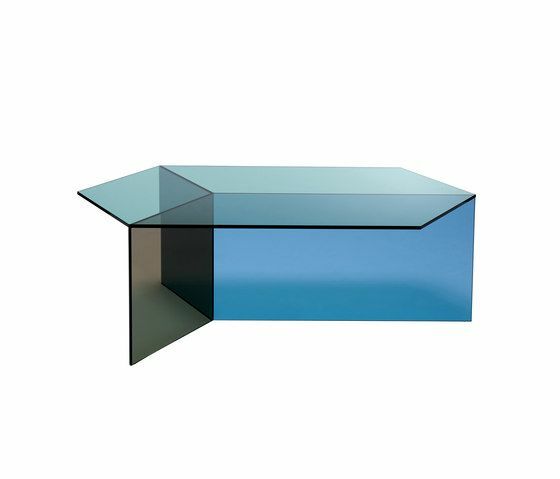 The tables are made from 10 mm strong coloured glass in blue, green, grey and bronze. The construction is as simple as ingenious. A hexagonal glass top lays on three vertical rectangles, that meet in the center. The dark reflecting cut surfaces build rhombuses, which evoke the illusion of an isometric cube. This effect increases by the overlaying transparent colours varying in their intensity depending on your perspective. The table with multiple colours and the set impress most. Isom „cube“ is available in two sizes, 90 cm in diameter, 30 cm high, and 90 cm in diameter, 38 cm high. Both sizes also as long version Isom „square“.